This entry was first published on March 30, 2018. No earlier editions exist. Recent years have witnessed rapid advances in location-based services (LBS) with the continuous evolvement of the communication technologies and mobile devices that underpin and support the services. At a high level of abstraction, LBS can be defined as computer applications (specifically, mobile computing applications) that deliver information depending on the location of the device and the user (Raper et al., 2007), mostly through mobile portable devices (e.g., Global Positioning System (GPS)-enabled smartphones) and mobile networks (e.g., wireless telecommunication networks and Wi-Fi networks). Recently, LBS have become more and more popular not only in citywide outdoor environments, but also in shopping malls, museums, and many other indoor environments. They have been applied for navigation systems, emergency services, tourism services, intelligent transport services, social networking, gaming, healthcare services, etc. (Gartner & Huang, 2017). 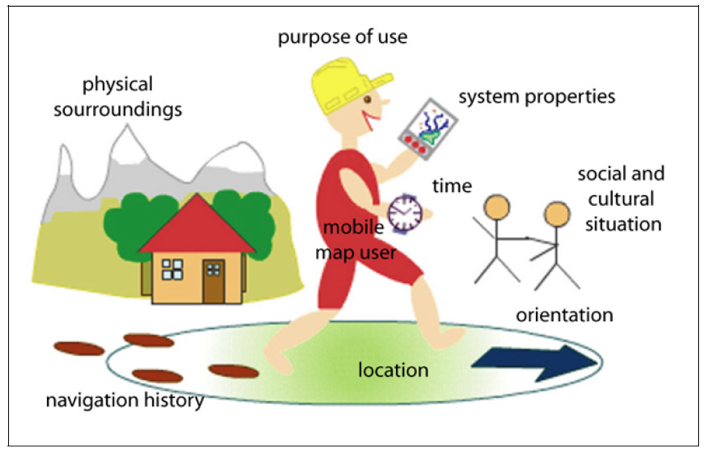 LBS are different from other traditional geographic information systems (GIS) and web mapping applications because they are aware of the context within which their users are currently in, and can adapt the contents and presentation accordingly (Steiniger et al., 2006). Another distinct characteristic is that LBS are often used in a dynamic and mobile environment. These distinct characteristics make the development of LBS applications different from other GIS applications. In the following, we introduce the essential components within LBS from a system perspective. After that, we discuss the main tasks that LBS needs to deal with, i.e., positioning, modeling, and information communication. The key technologies and components of each main task are introduced. We then introduce the typical LBS applications and emerging trends. We conclude with a summary of the ongoing evolution and challenges in the domain of LBS. To make LBS work, several key components are necessary: a mobile device, positioning capabilities, a communication network, and a service and content provider (Figure 1). In the following, we introduce each of these components. Figure 1. System components of LBS (adapted from Steiniger et al. (2006) at CartouCHe under CC BY 2.0). Mobile device: A client for the user to request and receive the needed information according to his/her location in mobile environments. The results can be given in various forms, such as graphical (e.g., mobile maps, augmented reality, and 3D), verbal (e.g., verbal instructions), haptic (e.g., vibration), and hybrid. Possible devices include smartphones, wearable devices like smartwatches and digital glass, haptic devices, public displays, built-in devices (e.g., built-in car navigation systems) and so on. Positioning: The positioning component determines the current location of the user. For outdoor LBS applications, GPS is often used. Map matching algorithms are often employed to improve poor GPS accuracy in urban environments. For indoor LBS applications, other technologies are available, such as WiFi, Bluetooth, and radio-frequency identification (RFID). Communication network: The communication network (for example cellular network or WiFi network) transfers the data and service request of the user from his/her mobile device to the service and content provider, and sends the requested information back to the user’s device. Service and content provider: The service and content provider processes the user’s requests, and returns the needed information. It might not store and maintain all the information, and very often needs to access and integrate other data sources (e.g., geographic boundaries, road network data, points of interest (POI) data, and event data) for service request processing. In some LBS applications (e.g., built-in car navigation systems), the last one or two components might be missing, as the LBS applications may already store all the information locally on the mobile device, and process all the service requests solely on the device. Therefore, there is no need to send the request over the communication network to the service and content provider. However, recently, new built-in car media information systems have adopted new standard (e.g., CarPlay) for incorporating the communication network and location-based services available on smartphones into the car infotainment systems dynamically. Positioning is a key element to support LBS. It involves a variety of location sensor technologies and positioning methods which have been developed for both outdoor and indoor environments. 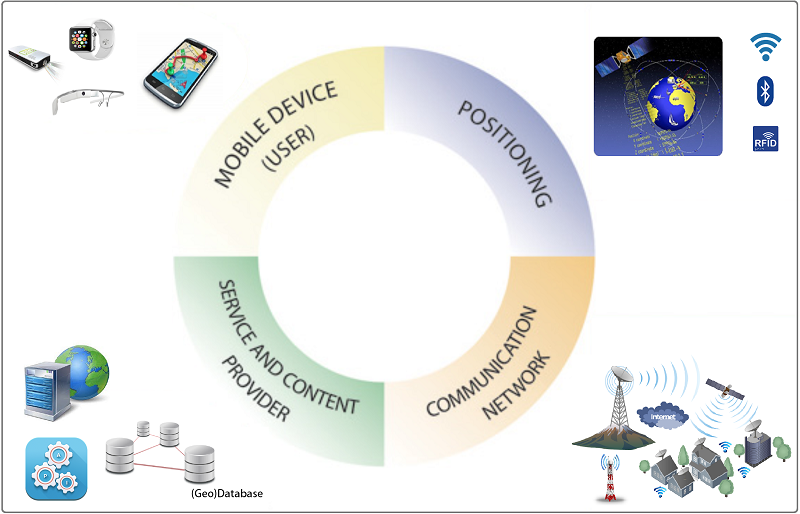 Depending on the development of information technology infrastructures, the mainstream outdoor positioning technologies include global navigation satellite systems (GNSS), cellular networks, and wireless networks. GNSS: GNSS provide the location (latitude/longitude) and time information in all weather conditions, anywhere on or near the Earth's surface where there is an unobstructed line of sight to at least four or more global positioning satellites. Well-known GNSS infrastructures include the United States NAVSTAR GPS, the Russian GLONASS, the Chinese BeiDou Navigation Satellite System, and the European Union's Galileo system. The most popular GNSS deployed on mobile devices on the current market share is the GPS. Trilateration is a classic approach to determining a GPS receiver’s coordinate by measurement of distances (Hofmann-Wellenhof et al., 2012). Many positioning techniques and methods have been developed based on high-accuracy GPS chips, differential GPS, and assisted-GPS. To improve location accuracy in dense urban environments, map matching is often employed. Cellular networks: Nowadays cellular networks are one of the most important communication infrastructures among people and have almost a worldwide coverage. When a mobile phone call is made, the mobile signal is usually linked to the nearest cell tower within its traffic capacity. The location of the cellular tower can be used to estimate a mobile phone user's location when he or she makes a phone call. The spatial divisions of such cellular networks are divided into cells (regions) based on the Voronoi diagram in which each cell tower is located (its center). There is a corresponding region consisting of all points closer to that center than to any others. That is, all phone calls within a given Voronoi polygon are closer to the corresponding cell tower than to any other cell towers. Generally, urban core areas have a higher density of mobile cells where the average distance between mobile base stations is approximately one kilometer; the value of average separation depends on the size of the study area (Gao et al., 2013). Wi-Fi: The Institute of Electrical and Electronics Engineers (IEEE) 802.11 work group documents the standard use of Wi-Fi technology to enable wireless network connections in five distinct frequency ranges: 2.4 GHz, 3.6 GHz, 4.9 GHz, 5 GHz, and 5.9 GHz bands. The widely use of Wi-Fi access points for Internet connection in hotels, business buildings, coffee shops, and many other fixed places has made Wi-Fi become an attractive technology for the positioning purpose. All of those Wi-Fi routers deployed in fixed places repeatedly broadcast wireless signals to the surrounding area. These signals typically travel several hundred meters in all directions such that they can form wireless signal surfaces, and one device could receive distinctive signals at different locations on the surface for localization. The accuracy of localization is then dependent on the separation distance among adjacent Wi-Fi reference points and the transmission range of these reference points (Bulusu et al., 2000). Zandbergen (2009) systematically compared three dominant positioning technologies: Assisted-GPS, Wi-Fi, and Cellular positioning. Their pros and cons are discussed in terms of coverage, accuracy and reliability. It reports that Assisted-GPS obtains an average median error of 8m outdoors while Wi-Fi positioning only gets 74m of that and cellular positioning has about 600m median error in average and is least accurate. However, GPS positioning chipsets don’t work well in indoor environments due to limited satellite visibility; and thus a number of indoor positioning technologies and systems have been designed and developed to increase the accuracy of indoor positioning. In general, indoor positioning technologies can be classified into two broad categories: radio-frequency-based (RF) and non-radio-frequency-based (NRF) technologies. The RF group includes but not limited to WLAN, Bluetooth, and RFID systems, while the NRF group contains ultrasound, magnetic fields, and vision-based systems. Researchers have made advances in indoor positioning using these sensors and technologies. The spatial coverage area and positioning accuracy of those different technologies have been reviewed by Mautz (2009). Here, we only briefly discuss the RF technologies that are most popular in the market share and have many challenging issues to investigate. WLAN: Positioning systems using wireless area local network (WLAN) infrastructure are considered to be cost effective and practical solutions for indoor location estimation and tracking. The wireless networks are widely implemented in many types of indoor buildings in which wireless access points are usually fixed at certain positions. Those access points allow wireless devices (e.g., mobile phones, laptops and tablets) to connect to a wired network using Wi-Fi technology. And the relative distance between wireless devices and access points can be roughly estimated based on Wi-Fi signal strength using signal propagation models (Motley & Keenan, 1988). It is also well known that the accuracy of indoor position estimation based on Wi-Fi signal strength is affected by many environmental and behavior factors, such as walls, doors, settings of access points, orientation of human body, etc. (Ferris et al., 2007). Therefore, a fingerprint positioning approach is often employed, in which the currently measured fingerprints (e.g., received signal strength indicator, RSSI) are compared with previously measured fingerprints in the database to determine the current position. In practical applications, a good approximation of heterogeneous environmental signal surfaces could help to improve the indoor positioning accuracy. Spatial regression, a widely used spatial-analysis method in finding spatial patterns of surfaces, could potentially be a good candidate. A geoprocessing workflow for generating indoor WLAN signal surface from limited samples for positioning has been proposed by Gao & Prasad (2016). Bluetooth: Bluetooth technology that is designed for low power consumption allows multiple electronic devices to communicate with each other without cables by using the same 2.4 GHz radio-frequency band as Wi-Fi. The distance range within which Bluetooth positioning can work is about 10 meters. In the beaconing mode, Bluetooth-permitted messages can be used to detect the physical proximity between two devices (Faragher & Harle, 2014). In an indoor environment equipped with equal or larger than three Bluetooth low energy (BLE) beacons, the location of a target mobile device with Bluetooth can be determined using geometric trilateration or fingerprint positioning approaches. In this way, location-dependent triggers, notifications and tracking activities can be enabled by employing multiple BLE beacons. There are several popular BLE beacon-positioning industry protocols and technology available online including Apple iBeacon, Google Eddystone, and Qualcomm Gimbal, which guide developers to implement up-to-date indoor positioning and tracking applications. Radio-frequency Identification (RFID): RFID is a general term used for a system that communicates using radio waves between a reader and an electronic tag attached to an object. Compared with Bluetooth technology, RFID systems is usually comprised of readers and tags that store relatively limited information about the object such as location and attribute information. Those tags can be activated to send out stored information if they receive the signal from RFID readers within certain distance thresholds, which can then be used to estimate the reader’s location and to show relevant information. Currently RFID positioning and tracking systems are widely used for asset tracking, shipments tracking in supply chains, and object positioning in retail places and shopping malls. Because of the sensor diversity and positioning challenges in various indoor environments, there is also an increasing trend towards combining and integrating multiple sensor networks to get better spatial coverage and positional accuracy than using a single data source. LBS are mostly designed to facilitate users’ daily decision-making and activities in space. Users are central to LBS. For effectively supporting users, LBS should provide information and services relevant to the location, context, characteristics and needs of a mobile user. These kinds of information about the user are important considerations in the course of designing LBS, including user interfaces (Jiang & Yao, 2006). The user is a starting point for any LBS application design, and therefore the approach of user-centered design (UCD) is often adapted. Originally introduced in computer science, UCD tries to optimize the product provided according to what users want and need, rather than forcing them to change their behavior to accommodate the product. UCD becomes even more important in LBS as LBS users are often involved with other activities such as walking, driving, and sightseeing during the use of the LBS applications. Those not adapted to their users will be dismissed by them. Basic questions about the users in LBS include who are the users; what are their tasks, goals, and thus needs; and what are their preferences and constraints. Compared to users of other GIS systems and applications, the users of LBS are often non-specialist citizens with a wide diversity of interests and needs. A user model is the collection of personal data associated with a specific user. What data to be considered and modeled depends on the applications. Thoroughly understanding and modeling each user and his or her needs is not an easy task, as users are usually very diverse. Clustering the users in terms of personal profiles, interests, and behaviors is often employed when developing LBS applications. For example, to design an LBS application for a museum, the users can be classified in terms of the viewing styles and interests (Jiang & Yao, 2006): passionate users who need in-depth information on every exhibit, selective users who want detailed information on selective exhibit, and cursory users who move through a gallery and don’t become heavily involved in what they see. Based on the classification of users, LBS designers can then determine what kind of information should be provided to them, and in which ways. The information about users can be provided manually by users themselves when (first) using the application, automatically learned from their (past) behaviors or interaction with the application, or captured via a hybrid approach. While the first method can quickly collect main data about users, it lacks the ability to automatically adapt to changes in users’ interests and needs. The second method does not ask users directly for their personal data and preferences, but infers users’ interests and needs by interpreting their behavior. It is able to capture the changes of users’ needs. However, this method requires the system to collect a certain amount of data before it is able to model users’ needs with the sufficient accuracy. The hybrid approach is a mixture of these methods, and tries to combine the advantages of them. It first collects data by directly asking the users about their preferences and needs, and adjusts and updates the user models by learning from the users’ interactions and behaviors. As the term suggests, location plays an essential role in the domain of LBS. Common queries in LBS, such as “where am I”, “what is the nearest Chinese restaurant”, and “how do I get to X” are based on the locations of physical objects, services, or people. Location models provide means for spatial reasoning typically based on coordinates, e.g., to determine whether a coordinate is within a given range or which coordinates are nearby, as well as the topological relationships (e.g., overlapping or containment) between spatial objects, with formally defined topology using the framework of point-set topological spatial relations (Egenhofer, 1991), the region connection calculus (RCC) (Randell et al., 1992), or the dimension-extended 9-intersection model (Clementini et al., 1993). A location can be represented as geometric coordinates (e.g., the coordinate tuples reported by GPS in the WGS-84 reference system), or symbolic coordinates (in the form of abstract symbols, e.g., postal addresses, place names, or room numbers). Geometric coordinates, as most existing GIS adopt, allow direct distance calculation and topological relationship computation. In contrast to that in geometric coordinates, the distance and topological relations between two symbolic coordinates are not explicitly defined; however, symbolic representations are more in-line with the way how general public use to express locations and spatial features in human dialogues. Location modeling in LBS mainly deals with representing users’ current location, as well as representing geographic space and place for the LBS applications. For representing users’ location, global geometric coordinates (i.e., the WGS-84 coordinates reported by GPS) are often employed for outdoor LBS applications, while indoor LBS often use geometric coordinates in some local reference systems or even symbolic coordinates (e.g., room numbered as 8028). To support various queries in LBS, the geographic space should be also effectively modeled. While existing geospatial data provide basic data layers (such as topographic data and road network data), more data sources are needed depending on specific LBS applications. For example, for LBS applications designed for guiding tourists, all physical attractions (points of interests, e.g., museums, historic sites and parks) and their relevant information should be stored. Under an indoor environment, the combinational use of topology-based connectivity graph and the indoor structure map can facilitate the location modeling and navigation (Yang & Worboys, 2015). In addition to this static information, sometimes LBS applications also need to access information regarding mobile objects (e.g., locations of a user’s friends) or dynamic phenomena (e.g., events that are happening or will happen in a city). In recent years, new applications have also posed many new requirements for traditional geospatial datasets. For example, current LBS applications designed for car navigation often require real-time traffic information, and even real-time high-precision road maps with detailed signs. As these kinds of information are mostly from different data sources or providers, data integration is often needed when developing LBS applications. Compared to other GIS applications, LBS are often able to recognize the context in which they are being used and adapt their contents, interface, and system behavior accordingly. In other words, context-awareness plays an essential role in LBS. Dey proposed a broadly adopted definition of context: “Context is any information that can be used to characterize the situation of an entity. An entity is a person, place or object that is considered relevant to the interaction between a user and an application” (Dey, 2001, p. 5). In this sense, location and user are parts of context, however, there is more to context than location and user. Various studies have attempted to identify the different kinds of contextual factors that are potentially relevant to an LBS user. For example, Nivala et al. (2003) proposed a classification of contextual factors to be considered when developing map-based LBS, i.e., LBS that provide information and services via cartographic means. They identified 9 types of context factors: users (e.g., their user profiles and preferences), current location, time (e.g., time of the day, day of the week, months, seasons), orientation (i.e., direction the user is heading; in a tourist guide, it can be used to determine what historical building the user is facing), navigation history (e.g., where the user has been, and what he has seen and done), purpose of use (e.g., the activities, goals and roles of users), social and cultural aspects (e.g., who are with the user, social relationships), physical surroundings (e.g., lighting, temperature, weather conditions, noise level and the surrounding landscape), and device (e.g., type of devices, size of the display, input method, network connectivity). This kind of classifications provides some structures for the consideration of contextual factors. The contextual factors to be considered and modeled depends on the specific LBS applications (Huang & Gartner, 2009). After identifying the contextual factors to be considered, LBS applications need to gather data of these factors to recognize the context (situation) that the user is currently in. These data can be gathered directly from users via a questionnaire, from online data sources (e.g., weather condition can be obtained via online weather service APIs), or from various sensors on mobile devices or in the environment (e.g., data regarding current location, time and orientation can be gathered from sensors on mobile devices). Sometimes, low-level raw data, especially numeric sensor outputs, are often abstracted and transformed to high-level context or activity information (e.g., “driving”). For the sake of clarity and convenience, we introduce the above modeling techniques regarding the user, location and context individually. However, one must be aware that these aspects are inseparable and interlinked, and should be integrated in the modeling and design process for any LBS applications. For example, the development of an LBS application to support city tourists would need to consider and model all these aspects, and adapt its contents and presentation accordingly. Several further issues should be also considered in the modeling process. First, LBS are often used in dynamic and mobile environments, which implies that dynamics models regarding user, location, and context should be adopted. Second, as can be seen from above, many data represented in these models contain personal and sensitive information, and therefore privacy concerns are often raised. LBS designers often need to find a balance between privacy and the model quality. From a user’s perspective, LBS applications provide relevant information via mobile devices to support his or her decision-making and activities in space. This can be considered as a communication process, in which relevant (spatial) information is conveyed from LBS applications to the users. Two essential questions needed to be answered in this process: what information should be communicated to the user, and in which presentation forms. Answers to these questions highly depend on the user, location and context. In this section, we will first introduce the various presentation forms that have been proposed for LBS applications. We will then discuss the adaptation techniques in LBS. Similar to human communication, information in LBS can be communicated to their users in various forms, such as graphical, verbal and haptic. Among them, maps, as a graphical form, are the most popular one in LBS. The following introduces several main presentation forms employed in LBS. Mobile maps: Maps are generally the most important presentation form when communicating geo-referenced information. This also holds for LBS, as many of the questions LBS applications try to answer are geo-related. For example, “You-Are-Here” maps are often employed in LBS to answer questions like “where am I” and “what is here around me.” While map views based on general-purpose maps like Google Maps or OpenStreetMap are often employed, other kinds of maps are also proposed, such as schematic maps (like the London Tube Map), floor plan (e.g., for indoor applications), and 3D maps. One of the main design constraints when employing maps in LBS is the small screen size and restricted technical functionality of mobile devices (e.g., smartphones and even smartwatches in recent year). This motivates lots of research in the discipline of cartography to define and offer (improved or new) cartographic principles, rules, methods and techniques for mobile map design. Please see the topic User Interface and User Experience (UI/UX) Design for more details. Augmented Reality: AR is a novel interface technology that superimposes a computer-generated information (e.g., images or texts) on a user’s view of the real world, and thus providing an ‘augmented’ view. In recent years, AR has become a popular presentation form in many LBS applications. For example, a popular location-based game called “Pokemon Go” uses the technology to display virtual creatures on the camera view of the real-world environment on smartphones. Some of the LBS applications designed for navigation and wayfinding also employ AR, and superimpose route information on the real-world camera view (Huang et al., 2012). 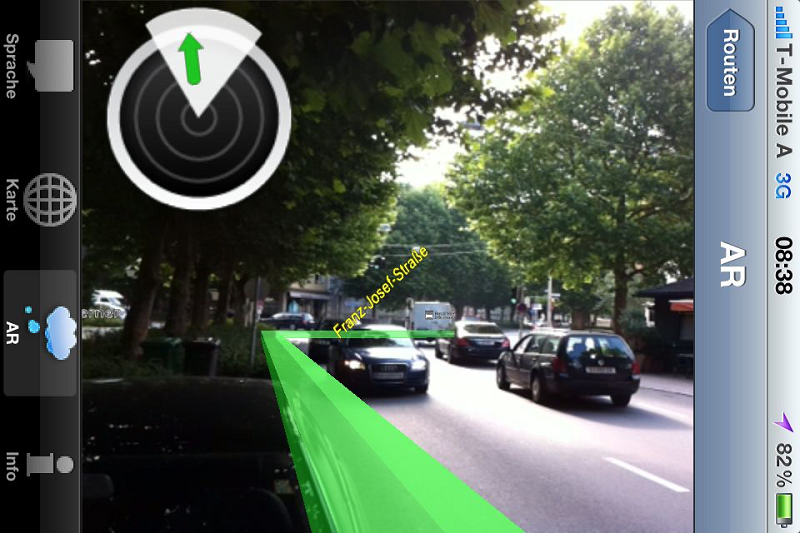 When using AR in LBS applications, sensors on the smartphones or other mobile devices, such as GPS, magnetometer and accelerometer, are used to calculate the position and orientation of the devices, which then allows the LBS applications to place the relevant information on the right place of real-world images being captured by the camera on the mobile device. Figure 3. A screenshot of the AR-based interface for outdoor pedestrian navigation, with a real-world camera view, route overlay, street names and relevant landmarks. Verbal descriptions: Information in LBS applications can be also communicated to users via verbal descriptions. These kinds of verbal descriptions are often communicated orally, and often combined with other presentation forms, such as maps. For example, car navigation systems, which are the most popular LBS applications, communicate route instructions verbally to their users, while they concurrently employ mobile maps to display an overview of the surroundings. Some of the advantages of verbal descriptions is that they require less technical resources and don’t demand users’ visual attention. Therefore, they are very useful for communicating information to visually impaired users. However, verbal communication can be easily influenced and restricted by the environment. For example, users are challenged to hear the verbal descriptions in a very noisy environment. Haptic feedback: Haptic or tactile feedback, such as vibration on smartphones, is less often used standalone but is rather integrated with other communication forms to enhance users’ experiences and performance with the LBS applications. It can be used to grab the attention of a user, but also as a mean to convey specific information. For example, vibrations are used by many pedestrian navigation systems to notify a user of a decision point where he needs to make direction changes. Some of the systems also use different vibration patterns and intensities to indicate left-turn or right-turn. As mentioned above, LBS applications should provide relevant information in a right presentation form matching the location, context, characteristics and needs of a mobile user. To identify “what information is relevant” and “how the relevant information should be presented,” LBS designers often need to employ empirical and user-centered approach, e.g., by carefully analyzing users’ information needs. Findings from the research domains of (spatial) cognition and ergonomics (i.e., human factors) are also integrated. Two different ways exist for adapting contents and presentation in LBS: adaptable and adaptive. This classification is a differentiation between manually and automatically performed adaptation process. Adaptable systems enable users to customize the services (i.e., contents and presentation styles) by themselves. The advantage of this approach is that “the user is in control with the system,” while the disadvantage is that “the user must do some (substantial) work.” In contrast, adaptive systems adapt their services automatically according to the modeled data regarding the user and the context. The advantage is “little (or no) effort by the user,” while it has the weakness of “loss of control.” Considering the fact that LBS users are often involved in many tasks and activities during using mobile devices, as well as the small screen sizes and restricted interaction functionality of mobile devices, adaptive services rather than adaptable ones should be introduced for LBS applications. LBS are rapidly evolving application areas with the advancement of many research projects and products (Schiller & Voisard, 2004), including navigation and routing (e.g., HERE WeGo), object tracking, city/museum guides (e.g.,“I amsterdam Maps & Routes”), emergency management, marketing (e.g., location-based advertisement), sports analytics, entertainment (e.g., location-based games, such as Pokemon Go), as well as emerging ones including ride-sharing (e.g., Uber, Lyft, and Didi), healthcare, social networking (e.g., Foursquare), social media, augmented reality (e.g., Wikitude), etc. Regardless of a specific application domain, LBS applications facilitate the interaction between the location and the user or among decision-makers. For example, high occupancy rates per vehicle through ride-sharing can help reduce traffic. With the help of LBS applications such as Waze and Uber, the crowdsourced navigation with near real-time information and the trip-based carpooling services become possible. However, the search for potential interaction locations and trajectories involving multiple people with their space-time constraints and activity participation remains a challenge (Wang et al., 2018). It requires the further development of tools, methods, and user interfaces to conquer the application challenges. Location-based social media are fast growing. Geotagged texts, figures, and videos are pervasively distributed in multiple sources, such as Facebook, Twitter, Instagram, and Flickr. Those geotagged contents are widely used in research domains including human mobility/migration analysis, events detection, business intelligence, epidemiology, and so on. In general, there are two types of LBS content: “At-the-location (Locale)” and “About-the-location (Mention).” The first type refers to those geotagged entries that are posted at that geographic location while the other type is not necessarily created at that geographic location where people just share their opinions or experiences. Data-synthesis-driven approaches by integrating high volumes of heterogeneous data provide a more holistic view about location awareness than using only one source (Gao et al., 2017). LBS have become more and more popular in our everyday life. Several trends can be observed from research and industrial development in recent years, especially concerning, e.g., the increasing demands in expanding LBS from outdoor to indoor and mix outdoor/indoor environments, from location-aware to context-aware, from navigation systems and mobile guides to more diverse applications (e.g., advertisement, entertainment/gaming, transportation and healthcare), from maps and audio only to more diverse and “natural” interfaces, as well as from technology-oriented to interdisciplinary research. These trends will continue in the coming years, and bring LBS smarter and more ubiquitous in many aspects of our daily life. Several challenges also exist in the domain of LBS, such as positioning accuracy, content quality, adaptiveness for new user interfaces, and privacy. Privacy is the primary challenge faced in the development of LBS. LBS in nature provide relevant information to users by making use of their current location and preferences, as well as the context the users are in. This information might be private and very sensitive, and therefore often raises some privacy concerns. To address these privacy concerns, different technical solutions have been proposed, such as K-Anonymity and obfuscation (see the topic Location Privacy for more details). Many governmental agencies and industry associations have also started to regularize the handling of private sensitive data in a legal manner, for example, the “Privacy and Electronic Communications Directive 2002/58/EC.” However, the question regarding accommodating LBS users’ privacy concerns will continue to be a primary challenge in LBS. On the other hand, as LBS are entering into general public’s daily life, this also brings some new issues concerning the social, ethical, legal and behavioral implications of LBS (Michael & Michael, 2011; Keßler & McKenzie, 2018). Clementini, E., Di Felice, P., & Van Oosterom, P. (1993, June). A small set of formal topological relationships suitable for end-user interaction. In International Symposium on Spatial Databases (pp. 277-295). Springer, Berlin, Heidelberg. Faragher, R., & Harle, R. (2014, September). An analysis of the accuracy of bluetooth low energy for indoor positioning applications. In Proceedings of the 27th International Technical Meeting of the Satellite Division of the Institute of Navigation (ION GNSS+'14). Ferris, B., Fox, D., & Lawrence, N. D. (2007, January). WiFi-SLAM Using Gaussian Process Latent Variable Models. In Proceedings of International Joint Conference on Artificial Intelligence (Vol. 7, pp. 2480-2485). Gao, S., & Prasad, S. (2016, October). Employing spatial analysis in indoor positioning and tracking using wi-fi access points. In Proceedings of the Eighth ACM SIGSPATIAL International Workshop on Indoor Spatial Awareness (pp. 27-34). ACM. Gartner, G., & Huang, H. (eds.) (2017). Progress in Location-Based Services 2016. Lecture Notes in Geoinformation and Cartography, Berlin/Heidelberg, Springer. Huang, H., & Gartner, G. (2009). Using Activity Theory to Identify Relevant Context Parameters. In G. Gartner & K. Rehrl, (Eds.) Location Based Services and TeleCartography II. Lecture Notes in Geoinformation and Cartography. Springer Berlin Heidelberg, pp. 35-45. Hofmann-Wellenhof, B., Lichtenegger, H., & Collins, J. (2012). Global positioning system: theory and practice. Springer Science & Business Media. Nivala, A.-M. & Sarjakoski, L.T. (2003). An Approach to Intelligent Maps: Context Awareness. Presented at the Workshop ‘HCI in mobile Guides’, Udine, Italy. Randell, D. A., Cui, Z., & Cohn, A. G. (1992). A spatial logic based on regions and connection. In Proceedings of the Third International Conference on Knowledge Representation and Reasoning(KR’ 92), 165-176. Schiller, J., & Voisard, A. (Eds.). (2004). Location-based services. Elsevier. Define Location-Based Services, Compare LBS, and other GIS applications. Name the key components of Location-Based Services. Describe key positioning technologies for outdoor and indoor environments. Demonstrate the key tasks of data modeling in LBS. Explore possible presentation forms for communicating relevant information to the users in LBS and discuss their pros and cons. Examine various application fields and investigate the potentials of LBS. Describe the challenges of privacy in LBS. What are Location-Based Services? What is unique of LBS compared to other GIS applications? What are the key components of LBS? Why are they needed? What are the existing location sensor technologies and positioning methods for outdoor and indoor environments? How would you evaluate the role of user-centered design in developing LBS? Explain what context means and why LBS need to consider the context of a user. List at least 5 examples of context factors that are often considered in LBS applications. What are the main presentation forms often employed in LBS? What are their potential pros and cons? Meng, L., Zipf, A., & Winter, S. (Eds.) (2008). Map-based Mobile Services: Design, Interaction and Usability. Springer.